View Current Domain Registration And Ownership Details. You can perform a WHOIS look-up to view current registration and ownership details of any registered domain name below. Protect your Domain Name, and keep your personal information safe. Some people might try and access your details to spread malware and send spam. By protecting your domain names, you are hiding the information they need to do this. Stop spammers from contacting you. Stop your details being used to send SPAM. Keep your business name squeaky clean by not being associated with junk email or scams. 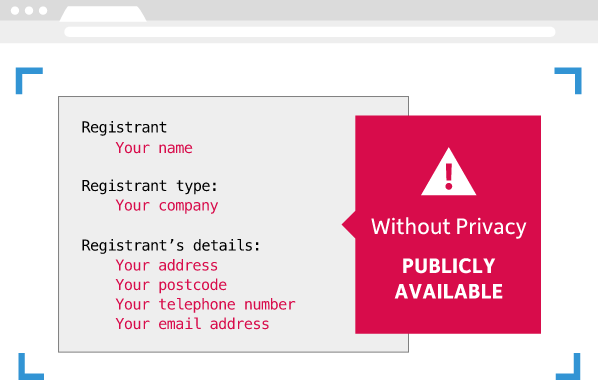 Keep your private details off the WHOIS database by replacing them with ours. You still own the domain, but your details won’t be visible to the public.